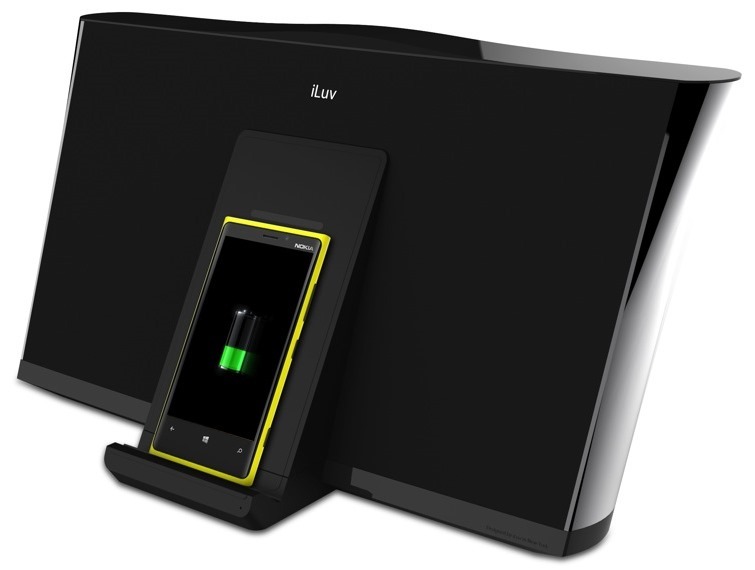 Over at CES 2013, iLuv unveiled a bunch of new products. The first one is the iLuv Aud 5, a speaker dock that connects to the iPhone 5 and iPad Mini’s lightning connector. One of the feature the speaker dock has is a tilting connector, theoretically allowing any iPhone 5 or iPad Mini with a case to connect to it. Other features include portrait and landscape connection and titanium based drivers. The second product is the iLuv MobiAria, a bluetooth speaker dock that takes advantage of NFC technology to quickly sync your Android phone to the speaker. Other features include on-bard touchscreen controls, voice based controls and titanium based drivers. The third product is the iLuv MobiRock, a speaker dock similar to the MobiAria. Like the MobiAria, the speaker has titanium based drivers, on-board touchscreen controls and NFC technology. One of the features that the MobiRock has is Qi Charging technology, a wireless charging system that charges many wireless charging compatible mobile devices. As of right now, pricing has not been announced and will be out this year.